And so is our annual Easter Egg Hunt! 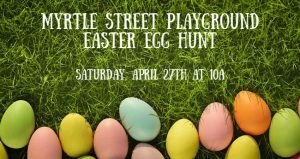 Join us on Saturday, April 27th as the Easter Bunny makes a very special appearance at the Myrtle Street Playground. Bring your baskets and come ready to hunt and play. The bunny will have treats for all – hip hop, hooray! Every summer the Friends of the Myrtle Street Playground sponsor weekly Thursday afternoon programming from June through August. In the fall, the Playground hosts a Back to School BBQ, an annual Tag Sale Fundraiser, and Halloween BOO Party. Spring brings the Easter Egg Hunt and an annual playground clean-up. Click around here to find out more about the committee and our events! We recommend you join our mailing list below as is it the very BEST way to keep up with the events and last minute changes. We look forward to seeing you at the playground! Thank you from a group of neighborhood moms!